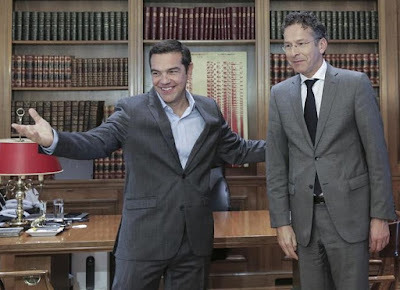 In Defense of Communism: Yes Man: Eurogroup's Dijsselbloem admits that "with Tsipras almost everything has been easier"
Yes Man: Eurogroup's Dijsselbloem admits that "with Tsipras almost everything has been easier"
"Feel like home". PM Tsipras welcomes Jeroen Dijssebloem. The outgoing Eurogroup president Jeroen Dijsselbloem admitted something that everybody knew: The fact that the SYRIZA-ANEL coalition government of Alexis Tsipras was easily submitted to the demands of the creditors thus doing the "dirty job" on behalf of the capital by imposing new harsh antipeople-antiworkers' measures. In an interview with the "Financial Times" on Friday, the former Dutch finance minister talked about the shambolic negotiations with the Tsipras government in the first half of 2016, as well as his tenuous relations with Yanis Varoufakis, then Greece's finance minister, generated immediate reverberations in Athens. "Prime Minister (Alexis) Tsipras and, of course, (current Greek finance minister) Euclid Tsakalotos, have completely changed the relationship with the European partners. Almost everything has been easier since ... it’s a completely different situation,” he was quoted by FT as saying.